Until recently B-spline curves and surfaces (NURBS) were principally of interest to the computer aided design community, where they have become the standard for curve and surface description. Today we are seeing expanded use of NURBS in modeling objects for the visual arts, including the film and entertainment industries, art, and sculpture. NURBS are now also being used for modeling scenes for virtual reality applications. These applications are expected to increase. Consequently, it is quite appropriate for The.N'URBS Book to be part of the Monographs in Visual Communication Series. B-spline curves and surfaces have been an enduring element throughout my pro­ fessional life. The first edition of Mathematical Elements for Computer Graphics, published in 1972, was the first computer aided design/interactive computer graph­ ics textbook to contain material on B-splines. That material was obtained through the good graces of Bill Gordon and Louie Knapp while they were at Syracuse University. A paper of mine, presented during the Summer of 1977 at a Society of Naval Architects and Marine Engineers meeting on computer aided ship surface design, was arguably the first to examine the use of B-spline curves for ship design. For many, B-splines, rational B-splines, and NURBS have been a bit mysterious. The only competition out there to Piegl and Tiller's seminal work is Gerald Farin's stuff. If you need to know about or use Bezier curves, B splines or NURBS, you need this book. The font being small and the wireframe diagrams being a bit hard to interpret are my only criticisms of this book...really, overall it is excellent and comprehensive. It arrived on time and was an excellent product. I have one pertinent thing to add to the other reviews: the index is quite lacking. I haven't yet been able to find anything I wanted to look up in the index. One of the greates assets of this book is that it is fairly comprehensive while still using a minimum amount of mathematics. The style is lucid, easy to follow; the numerous C-like algorithms can be adapted to one's own use, and deal with the most important aspect of NURBS. This is easily the best introductory NURBS text. The only problem I see is the lack of discussion for ray-surface intersection tests, which are necessary if NURBS are to be rendered by raytracing. I recommend "The Nurbs Book" to any engineers and graphics professionals interested in curved surfaces. 5つ星のうち5.0Perfect for the programmer working with NURBS. I have a reasonable if dated math background, but I'm not a mathematician, I'm a programmer. I was able to work through enough of the math to extract very practical and useful knowledge for my graphics programming work. I've gone through 3 other graphics book trying to get enough clear information on NURBs, but they were all either inadequate or obscure. 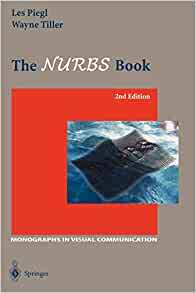 "The NURBS Book" is the one you want.